Vice President Mike Pence on Wednesday declined to answer whether he agreed with President Trump's statements the day before that "both sides" were to blame for the violence in Charlottesville, Virginia over the weekend. "What happened in Charlottesville was a tragedy," Pence said in a briefing with reporters during a trip to Chile, marking his first live comments since Mr. Trump's explosive remarks the day before. "And the president has been clear on this tragedy and so have I." 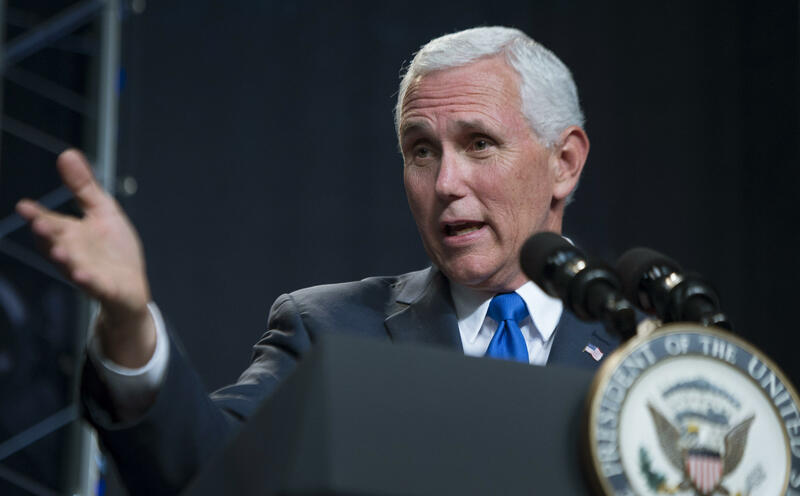 Pence, who is in the country to meet with Chilean president Michelle Bachetel, said he stands with Mr. Trump, and by his own remarks he made Sunday night about the violence. On Sunday, Pence condemned white supremacists, Nazis and the KKK. But on Wednesday he dodged directly addressing whether he agrees with Mr. Trump's most recent comments. "But together, while I'm here in Chile, our hearts are in Charlottesville," Pence said. "Because just a few short hours ago, family and friends gathered to say farewell to a remarkable young woman, Heather Heyer," Pence continued, referring to the woman who was killed when a man at the rally drove a car into a group of counter-protesters. "And we're also praying that in America we will not allow the few to divide the many," Pence added. Mr. Trump on Tuesday went off script with a series of comments to reporters about the deadly events in Charlottesville, Virginia, blaming "both sides" for the violence that resulted in the death of Heyer. He also said that some who attended the rally of white nationalists and Nazi sympathizers were good people exercising their First Amendment rights. The political fallout from the president's most recent remarks came swiftly, with multiple business executives resigning from his manufacturing council and strategic policy forum. Mr. Trump on Twitter Wednesday announced he was disbanding both. Even top members of Mr. Trump's own party have parted with Mr. Trump on Charlottesville. "There are no good neo-Nazis," Senate Majority Leader Mitch McConnell (R-Kentucky) said Wednesday. "Mr. President, I encourage you to try to bring us together as a nation after this horrific event in Charlottesville," Sen. Lindsey Graham (R-South Carolina) said in a statement. "Your words are dividing Americans, not healing them."